It's 7:00pm! Where Are My Google Ads?!? 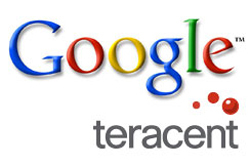 A question we hear quite often from internet marketing clients is, "Where are my Per Click Ads? I searched our keywords on Google and our ads are not showing!" And they’re right. They’re not showing. But why? There are a number of reasons why your ads may not appear when you search. Anything from a monetary reason, to a scheduling one. Let’s look at a few of the major reasons your ads are not appearing. This is the first thing to check! When reviewing your campaign, whether you created it yourself, or left it to a professional search marketing company, you should always review your keywords and keyword reports. Before your campaign is launched, carefully review all of the keywords you or your marketing team have selected to ensure there are no missing words. Don?t see a keyword you want in there? Don’t freak out as you can add or remove keywords at any time. You should also receive regular keyword reports from your marketing team and/or your pay per click provider. Review these reports to ensure important keywords are active and running in the campaign. If the keyword you are searching on Google is not on these lists, it most likely won’t trigger your ad when you do a Google search. Check out this report first. If you don?t see your keyword in your reports then you need to get it added right away! 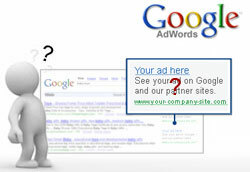 Google Adwords campaigns are set up with a daily budget. If you set a monthly budget for your paid search advertising, your daily budget can be set by dividing your monthly budget by the amount of days in the month. Logically if your monthly budget is not set high enough to satisfy the volume of traffic that paid search systems could send to your site then at some point during the day you will reach your budget and your ads will stop showing. This is the most common reason that your ads are not showing when you check and they are not displaying! Further to this, you can also set your daily budget to spend in one of two ways. The first is to spend it as quickly as possible, allowing the Google Adwords program to display your ads as often as possible from the beginning of the day in order to quickly acquire traffic to your site. Once you have attracted enough clicks to spend the daily budget, the AdWords system turns your ads off for the remainder of the day. The second setting displays your ads evenly throughout the day. The Google system anticipates expected clicks and displays your ads based on this expectation, as well as what your daily budget is. This results is your ads being shown on a limited basis, perhaps once or twice in every 10 searches throughout the day. Your ads in this case would be spread out during the time specified in your ad scheduling. If your budget is set too low then you will obviously experience times during the day that ads are not online. In both cases, your daily budget can be spent before the end of the day or the end of your scheduled times. Once a daily budget has been met your ads, as mentioned earlier, will stop displaying until the following day. The larger your budget and smaller your cost per click, the more your ads will appear and continue to appear throughout the day. The cost per click in many industry verticals can be quite high because of the competitive nature of their market. In the United States, someone in the insurance business should not be surprised to pay between 10 and 20 dollars per click for the more "in demand" words they use, like ‘car insurance’ and ‘house insurance policy’. If your bid price falls below a certain amount, AdWords will slow down the display of your ads, and in some cases will come to almost a complete stop. This is when Google believes your current bid price is "below first page placement", meaning it does not expect your ad to appear on the first page at your current bid price. In this case, higher per-click bid prices are necessary in order to begin displaying your ads again on a more consistent basis. If your budget is set too low, this likely means that the amount you can spend per click is lower. This means that you may not see your ads when doing a search. Think about your business for a moment. Does it make sense for you to display your ads 24 hours per day, 7 days a week? It might if you are an online retailer or take orders or information requests that can be fulfilled at any time. But what if you are a medical office, hoping to book new patients? What about a consultancy business with a limited budget? In these cases, you want to get the most out of your advertising dollars, and be able to answer requests and book appointments during regular business hours. Google’s ad scheduling option allows you to set specific times during which your ads will appear. You can schedule your ads to the nearest quarter hour. So you can start at 3:15 and end at 7:45 or 8:30. It’s very easy to set up. With a limited budget, or the need to have calls and emails answered immediately by a live person during business hours, it makes more sense to limit the times during which your ads appear. If your medical clinic is open from 8:00am to 6:00pm, you can schedule your ads to appear during these hours. You can even stop the ads at 5:45pm in order to ensure they have stopped appearing before you close for that business day. Ad scheduling is a very handy tool to allow you to make the most of your ad budget. By showing ads during times which are proven to provide higher conversion rates your budget can be maximized. 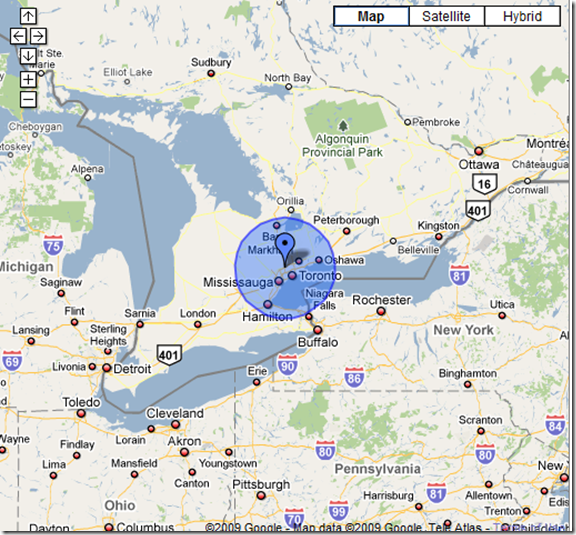 Google AdWords allows you to target ads to specific geographic regions. This means your ads will not appear to Google users searching your keywords outside of the area you service. Both the the Bing and Google system allow to GEO target ads by country, state/province, city, by zip/postal code or by specific distance from a given point in a city. The below image shows you an ad campaign we are running that extends 80km from the core of Toronto, Canada. There are a few minor imperfections you should know about. As you may or may not know, Google knows where you are geographically by your computer’s IP address. Some Internet service providers do not allow Google to "see" your computer and the Googlebot is then stopped at your ISP’s location. This results in one of two situations. In the first case, your ISP may be outside of the geographic region you have targeted your campaign to. If this is the case, computers accessing from that IP address will not see your ads. In the second case, the person searching may be outside of your geographic target, while their ISP is within it, meaning they will see your ads but are not necessarily part of the demographic you wish to target. These situations are not incredibly common and Google does display your ads properly in most cases. This also can occur for business limiting access via a corporate network. In some cases, the network may be located in another city entirely, and any searches in your city may return results aimed at the other. All things considered, GEO targeting is still a heck of a lot more powerful than anything type of targeting you would get in either radio or television. Google AdWords does respect trademark ownership if the owner files the proper paperwork. In this case, if you have a trademarked term in your ad copy, or you are using a keyword that a trademark owner has claimed, then your ads and/or keywords will stop working without permission to use the words from the trademark owner. Is Everything Simply on Hold? Are you not seeing your ad for any keyword? Are you 100% certain it should be showing? Maybe everything is on hold. 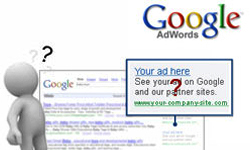 Google allows you to pause all or parts of your advertising campaigns at various levels. Entire Campaigns, individual Ad Groups, and single keywords can all be paused in AdWords. Even your ads themselves can be paused. Review all areas of your account or have your internet marketing team go through everything in the account in order to ensure you have not placed anything on hold that should not be. Pausing even a single important keyword can cost you significant numbers of visitors, resulting in lost business. Google Adwords is a complex beast and there are multiple reasons why your ads might not be reaching out to as many potential customers as possible. In our experience it is generally your budget being reached, however a qualified Adwords professional will make sure that you maximize the efforts of your ad spend. So before you go racing to your Adwords professional up in arms, these are all things that you will want to keep in mind as key contributors why your pay per click ad may not be showing. Evaluate these reasons and you will likely gain a better understanding and more educated approach with how to remedy the problem. And as always – let us know if we can help you out! That’s an educative post, great thanks Matt. I always scout for these type of posts for it brings light on certain relevant, but un-talked areas. Those points are subtle and unnoticeable, but little by little they have role in deciding the overall performance of our ads. Good and informative notes. Always wonder about the plethora of handy functions facilitated by Google to users. But getting familiar with all of it is cumbersome. Posts like this helps us understand and handle such situations. Thanks Matt for writing a long post and educating us the features of PPC. 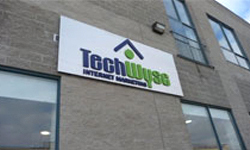 It’s great to know that clients have control over the budget, ad display time and even geographical location ! This can really help to make sure that the money we spent is utilized properly.